Le Spa. Is This The Best Spa In Paris? 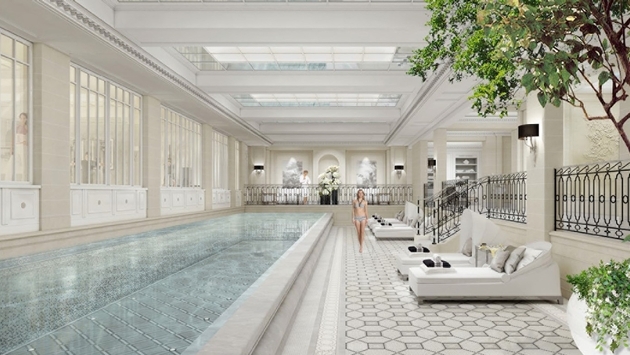 Inside one of the world great Day Spas, Le Spa, George V Hotel, Paris. Is This The World’s Most Magnificent Day Spa? Upon arrival, it’s hard to know whether to indulge in a glass of champagne in the black and white contemporary reception or one of the three flavours of delicately hand made energy balls on offer with fruit infused water. Both seem equally decadent and at home here. 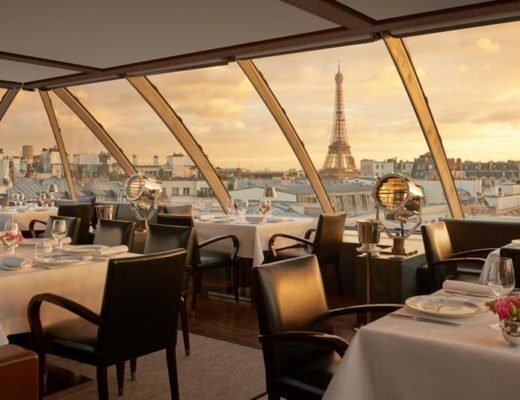 The good news is you can actually soak in champagne here, but more about that later. 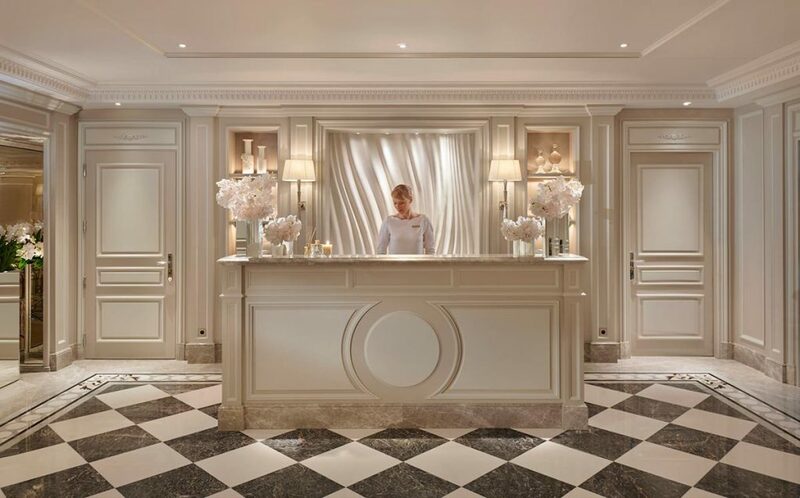 Walking into the new ultra-luxurious spa, Le Spa at The Four Seasons George V is like walking into the most magnificent day spa you could ever dream of. It was closed for two years, and has undergone a complete refurbishment that is as stylish as it is serene. 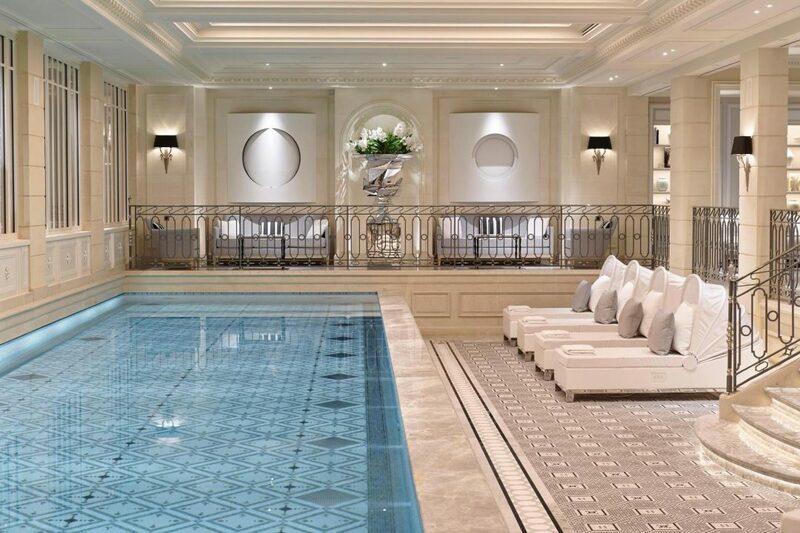 Set over more than 74 square metres, he feel of Le Spa is one of opulent grandure, with marble, and muted colours including white, cream and silver in abundance. A spectacular 17 metre swimming pool heated to 34 degrees celsius with dazzling poolside cabanas greets guests upon arrival into the reception area as well as a vitality pool with hydro massage jets. The staff are also picture-perfect and wearing white and black outfits that look straight out of Moschino. Service is flawless, yet intimate and warm. 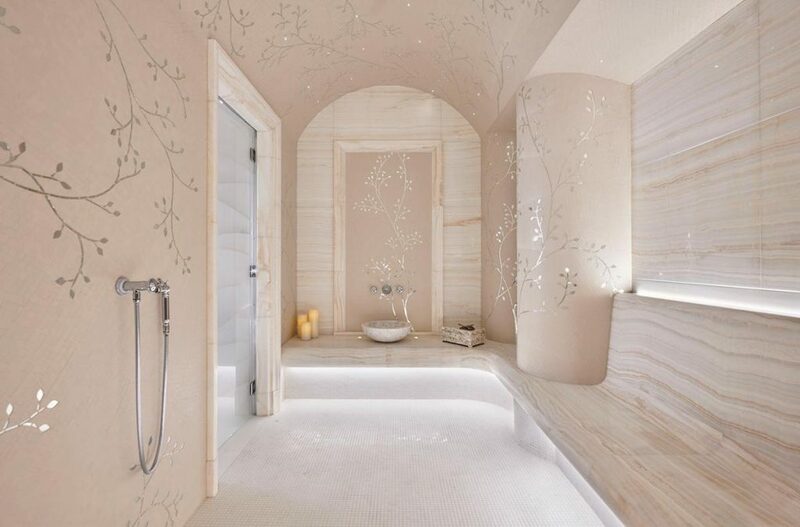 The women’s hammam at Le Spa, Four Seasons George V with delicate mosaics featuring trees on the wall. The attention to detail at every turn is acute, and undeniably quintessentially French. The feel at Le Spa is a magnificently opulent blend of French, Greek, Roman and Turkish inspired interiors abundant with artistically designed fresh flowers. The 5 exquisite treatment rooms are lined with intricately embroidered wallpaper, and decorated like the lush interiors of one of Paris’ most upmarket apartments. They include heated beds warmed to your desired temperature, a choice of music, and a separate couples room. There is a menu of results-oriented treatments that are as magnificent and detailed as the setting and include Japanese and traditional Chinese massage and facial methods including jade facial rollers and techniques to release energy blocking. There is even a chardonnay body scrub, and a champagne oil facial. Pure gold power is used on the skin to refine, of course it is. There are bespoke treatments and Alaena organic products from the South of France feature in many treatments. The cutting edge fitness centre at Le Spa. There are men’s and women’s hammams, a delicately lit gold tree climbs the walls and ceiling of the women’s hammam using gentle mosaics. 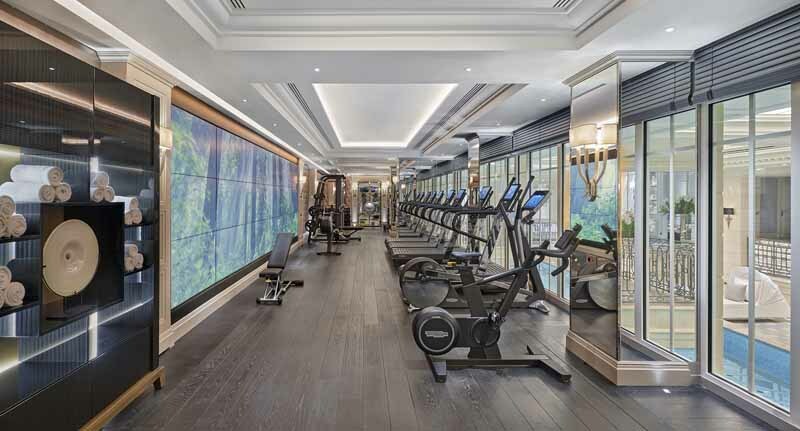 The cutting edge fitness centre is one of the largest in Paris’ 5star hotels, and has the absolute latest technogym equipment. A magnificent wall sized screen shows soothing images of nature during a workout to inspire and calm. Located around the corner from the Champs Elysees, it opens at 630am, perfect for early birds like me.